Need help with StresStimulus? Start here. Any settings that i need to be looking at ? In StresStimulus, usually, extractors are created from HTML responses (which are already decoded and are in plain text). Then when these extractors are used as parameters, StresStimulus automatically encodes their values when necessary. Double encoding would happen if an extractor is taken from an not-decoded response. Not sure how that's possible, though. Please describe how you created the extractor and what value does it return. I see what’s going on. Your extractors include special characters that are HTML-encoded. For example, instead of “<” the extractor returns “&lt”. StresStimulus does not provide HTML-decoding of an extractor, prior to URL- encoding of a request, parameterized with such extractor. We will issue a fix to add support for HTML-decoding extractors in a few days if not tomorrow. As a workaround for now, see if you can define your extractors more narrowly, so they do not include “<” or “>” characters. For example, from your screenshot, it looks like you take a circled snippet of the recorded request and replace the highlighted in green portion with the highlighted in yellow portion, as shown in the "Currently configured" column below. If you define your extractor to exclude %26lt%3C, as shown in the "Change to" column, then you'll get the same result, but HTML- encoding will not be an issue. Not sure if the workaround will fix all extractors, but, as I said, the fix will be released soon. We added support for HTML-decoding extractors. 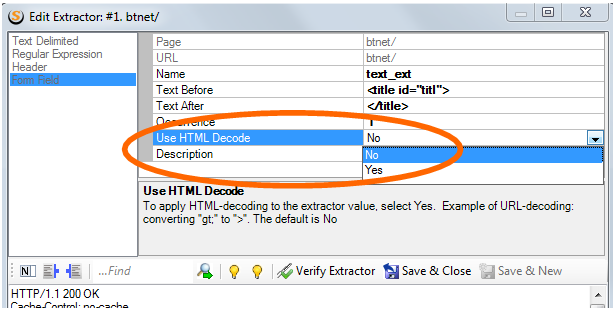 To use this option, change the new “Use HTML Decode” property in your existing extractors, which use encoded special characters, from No (default) to Yes, as shown on the screenshot below. As a result, your test should work without the workarounds, that I suggested yesterday. Use StresStimulus auto-update top install the new version. HI Vadim i downloaded the latest update but do not see the option in your screen cap above on the extractor screen. Check your StresStimulus version. In v2.5.4785 and above, extractors have “Use HTML Decoding” property. In case you can’t find it, please schedule a web support session at convenient time, using a link that I just sent you via a private message, and I’ll show you this property. Yep got it and worked very well thanks ! You're welcome, Sundara. Thanks for posting your feedback.